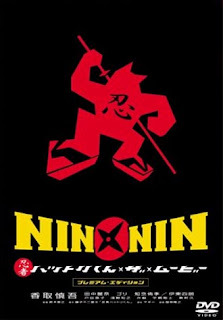 “Nin x Nin” opens with a shot of a handful of shuriken hurled from a mountaintop, slicing through, oh, 5 miles of open air, then through a forest and between the branches, untouched until they land—thunk thunk thunk!—in a tight cluster in a tree a few feet from their intended target. Within seconds their owner has followed them, descending the sheer cliff face and traversing the dense forest to engage in close combat with his adversary. One combatant wears a fierce Kabuki-style Oni mask and robes, the other an electric blue but otherwise traditional Shinobi Shozoku with matching Tabi boots. They disappear into the foliage and shadows then reappear on the attack, trying to one-up one another with every trick in the book. These are ninjas in the world of “Nin x Nin”. Blue ninja finally emerges victorious, his last sword stroke cutting away the Oni mask to reveal J-film mainstay Shiro Ito’s unharmed face. After a fight played without laughs, seeing that face immediately changes the tone from semi-serious to light. Blue ninja reveals himself to be SMAP’s Shingo Katori, a ninja trainee with a massive, guileless grin that recalls Ernest, the “Hey, Vern!” guy had he been shorter, cuter, and Japanese. This is the father and son Hattori family, Iga ninjas who live in a mountain cave striving to perfect their ancient art (don’t they all?). The two punctuate their sentences by grinningly chirping “NIN!”, both a characteristic of the source material manga and anime and an in-joke referring to the ‘70s/‘80s-era gameshow Ito hosted on which he also inexplicably said “NIN!” a lot. Presumably this is a wink and nudge to parents. Katori plays Kanzo Hattori, a young ninja about to embark on his final challenge: A solo trip to Tokyo where he must find and protect his master (who he will know when he sees him) and, most importantly for some unexplained reason, not be seen by anyone except this master. Soon Hattori-kun is atop Tokyo Tower looking for this new boss, and finally spots little Kenichi (Yuri Chinen), a boy of about 9, through his bedroom window. Kenishi’s parents love him but are absentminded in a way only movie parents can be, and soon Hattori-kun and Kenichi-kun are eating mayonnaise over rice and palling around. Hattori-kun’s antics—avoiding mom by sticking to the ceiling like a gecko, attacking the rice cooker when it beeps—are at times genuinely funny and play right into a 9-year-old’s fantasies about having a ninja of one’s own. For seemingly no reason other than to introduce a female character, the two befriend local girl Rena Tanaka, a pretty and conveniently blind painter. The plot, something about evil Koga ninjas using their powers for less-then-noble pursuits, is perfunctory given that the film only shines when Katori and Chinen are goofing around. Frequent close-ups on Katori’s mugging face should be grating but aren’t, and things chug along at a decent pace. “Nin x Nin” is unapologetically a movie for children. The tone fluctuates between light goofiness and goofy lightness, with intermittent smatterings of non-bloody ninja violence until a finale which is decidedly darker and dramatically heavier than the 90 minutes preceding it—nothing traumatic for the little ones, but strangely out of step with Hattori-kun’s antics up to that point. This schizophrenia robs the movie of a good deal of its charm. Several critics noted that the film’s arc from harmless hijinx to grave danger mirrors that of “E.T.”, but the danger inherent in the finale of “Nin x Nin” is forced and clumsy by comparison. Director Masayuki Suzuki’s previous film was “GTO”, also a manga adaptation, and his next film was the 2007 mega-hit “Hero” (which, as testament to the director’s commercial sense, more than doubled the Japanese gross of “Transformers”). Dude knows how to make an audience-friendly popcorn movie; he directs in a serviceable, broad, commercial style that strives for nothing more than clear storytelling. There are hints throughout that Suzuki and the cast recognize the fertile ground for jokes inherent in the concept of fully costumed ninjas running around present-day Tokyo, but aside from a few visual gags (one or two of which are genuinely inspired) nothing comes of it. A slightly different approach could have elevated this from mild entertainment to sublime humor, but no matter. It’s the best kid-meets-blue-ninja film I’ve ever seen.